There is a generally accepted notion that structured data represents only 20% of the information available to an organization, which means that the rest of the 80% is in an unstructured form. If businesses were able to somewhat manage customer churn and increase loyalty to some extent just by analyzing 20% of the structured data, then there would be a massive potential waiting to be leveraged in the analysis of unstructured data. In contact centers specifically, to understand the main cause for the customer call, analyzing only the structured data may not be enough. Unstructured data has hidden insights that can help us in knowing the actual reason for the customer call. What is affecting the customer experience? How can I prevent customer churn? How can I lower the service costs without affecting quality? These are the issues that need to be identified and answered for any profitable business. You may have deployed the best technologies yet are unable to reduce churn and increase customer loyalty to the extent expected. The solution to this dilemma is Text Analytics! It’s focused on extracting key pieces of information from the customer interactions, and these insights will help you in making decisions that will convert into result-oriented actions. What is driving the customer experience? Who are the at-risk customers? Are they expected to churn? What is driving the repeat calls? How do I manage the cost-to-serve? Customer churn is driven by a series of events that make them lose interest in your company. So, effectively using the unstructured data and historical data, and implementing text analytics will help us to know the key problems of the customers; and by knowing their problems you get a chance to offer targeted recommendations or incentives that your customers cannot resist. By personalizing rewards, customers feel valued and sense that they are part of your brand, which gradually improves their loyalty toward you. Summing up, today’s businesses calls for continuous optimization for loyalty, churn, and revenue. You must understand what your customers are saying, what they value, and what improves their satisfaction. 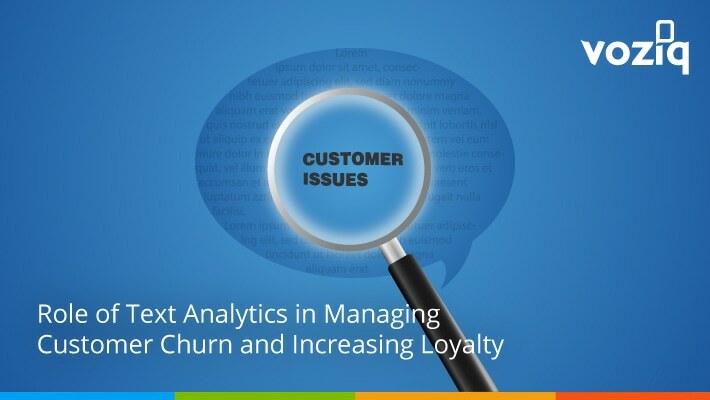 Only then you can manage customer churn and increase loyalty significantly.